This may be of interest to some of you who are interested in the Blockchain space. You can either invest directly in the company or do so via Vela Technologies PLC who have invested around £200,000.00 into Argo Blockchain PLC but they also have other Crypto/Blockchain investments like BTL Group, K2 Blockchain, etc. Apologies, I may have forgot to include the link above. 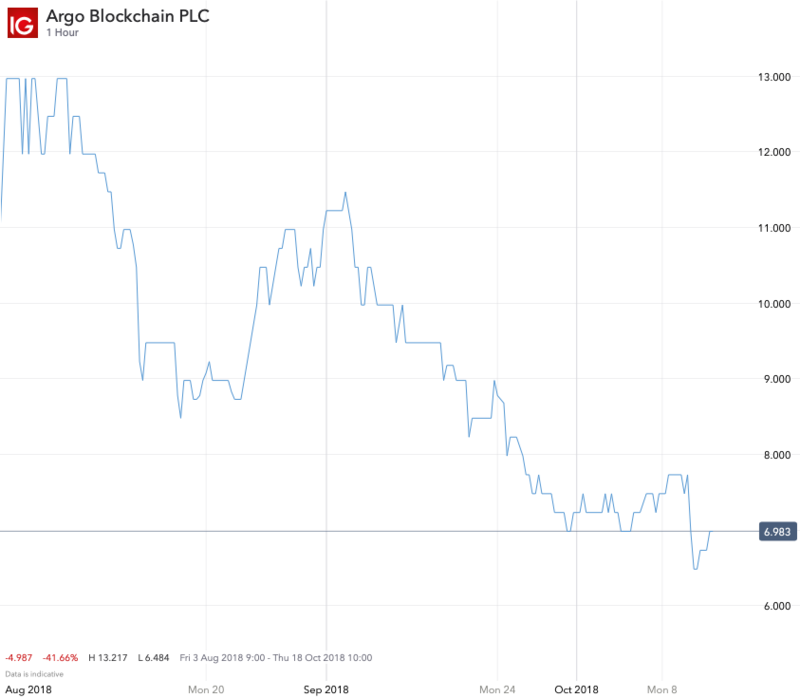 For those who may be interested then Argo Blockchain PLC is looking to raise around £20m at a valuation of £40m. Argo Blockchain PLC is an interesting one. Is there the demand or enough demand for people to open accounts, pay monthly subscriptions for mining cryptocurrencies? I am not sure at this moment. 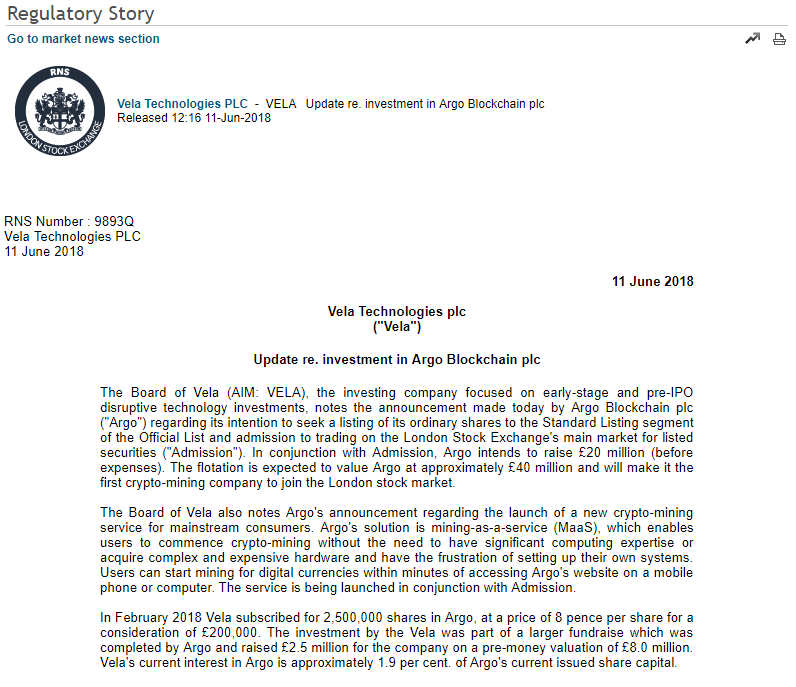 I am not sure whether I would invest at IPO stage in this company but I have indirect exposure via an investment in Vela Technologies PLC which has invested in Argo Blockchain PLC. This is a very interesting one on two levels. One is whether it can grow as a business, scale up using capital acquired and gain serious revenue growth going forwards. The other level is whether there will be enough investment demand in such a company? As an investor in Vela Technologies PLC, I am hearing that Argo Blockchain PLC's IPO listing is this Friday. However, I cannot see any information in relation to that anywhere on the internet. However, if it does list this Friday then next week will be interesting to see 1) the interest and demand for the shares and 2) the price and volume performance data for the shares. The packages are all showing as sold out but are they really? I don't know the answer to my question but if they are then this will be reflected in the financials in terms of revenues the company initially earns. You need to have a cryptocurrency wallet so that the mined coins can be sent to you in your wallet. It does not offer mining Bitcoin but it does offer the mining of Ethereum which has the second largest market cap of all the cryptocurrencies. What are your thoughts on the minable products they offer? Bitcoin Gold seems a bit ... odd? @JamesIG, My thoughts are that I am a bit disappointed. Bitcoin Gold is not even in the top 20 in terms of market cap. If they had offered Bitcoin Cash then it would have been very interesting. Ethereum is the only one that really interests me but is the demand there for Ether in terms of price appreciation of the coin itself? It is all to do with algorithms to mine with. They offer two, Equihash and Ethash. Equihash is a memory orientated proof of work algorithm developed by Luxembourg University. 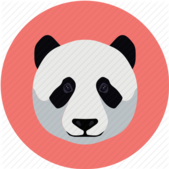 Ethash is the proof of work function in Ethereum based blockchain currencies. It uses Keccak, a hash function which was later on standardised to SHA-3. I am not yet convinced of the demand for this as for me this would only be of appeal to those who have truely embraced Blockchain and Cryptocurrencies and have spare money lying around to participate in such activity. Those who have embraced would need to have an interest in the mining side of things and a passion as well. I cannot see the demand for this right now though I accept I could be totally wrong. I am happy to keep an open mind and see how it plays out and let the revenue figures tell me how this is performing as well as updates as a shareholder from Vela Technologies PLC. Argo Blockchain PLC already manoeuvering itself into the UK Investor Show 2019. Argo Blockchain PLC gets a mention at the end under IPO Watch in share tips of the week in MoneyWeek. Nice little mention - also worth noting it's above our (IG's) requirement of £10m market cap to offer on leverage for UK stock. We will keep an eye on this one. The £20m raise could give an opportunity to the early investors to exit quickly with a profit. I am always weary of IPO's. As someone who invests in start up businesses, one of the main routes to exit for liquidity purposes is an IPO. That presents a liquidity event which enable investors like me to exit and for someone else to hold the shares and take on the risk. I cannot see institutional funds/money buying this stock so therefore it could get pumped up by speculators and then may present an excellent shorting opportunity. For example which investment trust, OEIC or unit trust would buy this stock? The obvious answer is technology funds but even they have strict criteria as they have performance targets to meet and strong risk management in place. Does anyone know when Argo Blockchain PLC IPO is listing? There are rumours of by the end of July 2018 but I have checked the London Stock Exchange website and there is absolutely no mention of this which also includes any AIM listings too. 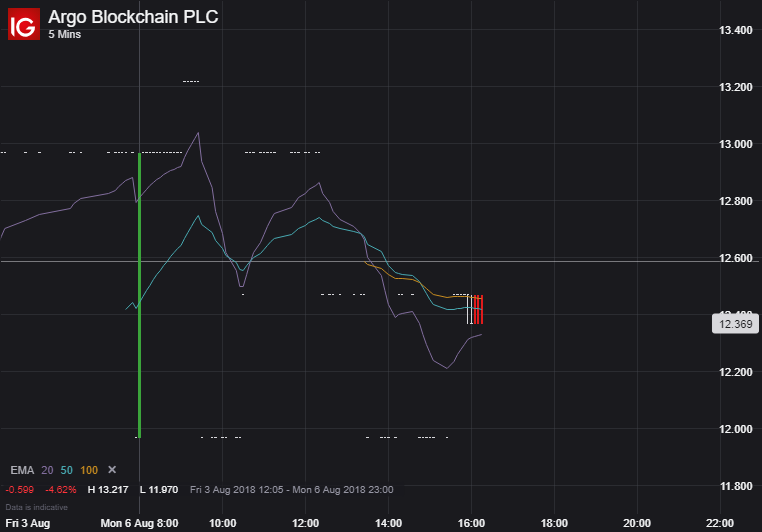 I wonder if Argo Blockchain PLC lists on NEX to join Coinsilium and KR1 (formerly known as Kryptonite1 PLC) or whether it joins the company which has invested £200k in it (Vela Technologies PLC) on AIM. Interested in this one too. I read tht link posted above and it said 40 mil. Would that make it big enough to get on the AIM? Also the fact that it was posted by LSE. I cannot see it having a problem listing on AIM but at present it is unclear as to whether it will list on the Main Market AIM or NEX? One could argue that NEX is a London Stock Exchange! I just checked the Argo Mining website. Its services are still all sold out. This is either fictional or we are about to see a major rise in the share price once IPO is completed. If this 'SOLD OUT' is not true then we could see an initial move upwards to entice new investors and then BOOM! Down it will go. I have to admit that the valuation is of an extremely high premium in my opinion based on current fundamentals. This may explain the initial fall in share price from IPO starting level. It has some interesting institutional support in the likes of Miton and Henderson so one has to keep an open mind. Also, has it really sold out all of the subscriptions? The website has show nothing but sold out on all three au subscriptions on offer. This doesn't trade very much so the chart looks pretty bad ... but this is available to trade on the IG platform both leveraged and non-lev. I think Argo Blockchain was just over valued at IPO. There are lots of people siting on losses who invested at the IPO price. The price action is pretty negative. We have an interview with Mike Edwards, president and co-founder of Argo Blockchain PLC tomorrow and just wanted to ask Community members if they have any questions they would like to ask? Feel free to add them below and tag me with an @ symbol. Thank you for this opportunity. It is very much appreciated. I have an interest, as a company I have shares in (Vela Technologies PLC) has a stake in this business. However I have just looked at the significant shareholders list on Argo's website and they do not make the list so their stake must be very small. What surprised me is that the likes of Miton Asset Management, Janus Henderson Investors and Jupiter Asset Management have taken significant stakes. These could be for their micro / small cap funds or their technology funds, not sure. (Q1) Are they able to confirm which? (Q2) Where do Vela Technologies PLC fit into their shareholder base? On Admission Vela will own 2,500,000 shares in Argo representing 0.85 per cent. of Argo's enlarged share capital. At the placing price of 16 pence per share Vela's holding in Argo will be valued at £400,000. Vela originally subscribed for 2,500,000 shares in Argo in February 2018 at a price of 8 pence per share for a consideration of £200,000 as part of a £2.5 million pre-IPO fundraise. (Q3) Every time I look at the Argo website to see the mining packages they are sold out. This is extremely frustrating. Surely demand should have been taken into account before offering such a proposition to the market? What research was done prior to this as constantly sold out though is positive will only count for anything if some serious profit and financial results are reported at end of year. This was announced a few days ago on Proactive Investors. I hope something new is offered with the interview with IG. (Q4) Have IG approached Argo or have Argo approached IG? Who pays who for this interview? This is more of an internal question. (Q5) Going forwards what other Cryptocurrencies are going to be available? (Q6) Is it possible that Argo will be able to offer Crypto Wallet facilities like Abra and Coinbase in the future? (Q7) What valuation targets have Argo set themselves? Are they looking to be acquired by a 'bigger fish' or do they have ambitions to be the 'bigger fish'? (Q8) Are there likely to be any acquisitions in the future that could enhance their proposition? (Q9) What is their strategy to be able to cope with the demand so that they can maximise revenues? Right now they cannot meet demand which means they are losing sales and revenue. This is not good. (Q10) What revenue and sales targets have they set themselves? How do they intend to increase sales and revenues year on year? This is what the market and investors (especially retail institutions) look for. What were the reasons why the likes of Miton, Janus Henderson and Jupiter bought in? This is an extremely high risk business listed on AIM (known for 90% of the companies listed being poor investments). (Q11) In my opinion for Argo to succeed it will need strong leadership, ability to raise capital whilst demonstrating a rising share price and management being able to execute a clear and sound strategy. There is 'execution risk' and it will require competent personnel. Are there any thoughts of recruiting some 'heavyweights' in the industry to really drive the company forward? 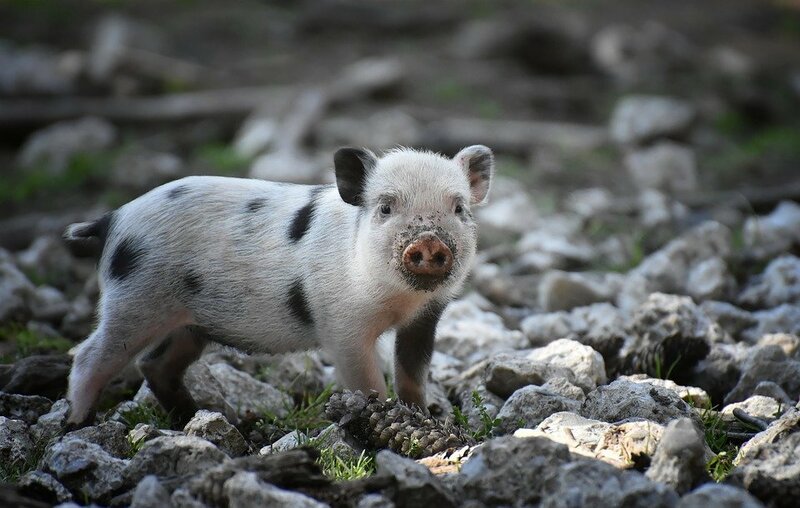 @JamesIG, I could go on and on but will give others a chance as well! ? OOoooo nice. Tell you what I want to know: what is the process for picking which coins to add? You didn't start with the bench marks such as bitcoin, and you've also added things like Komodo and Horizon coins (both of which I have no idea what they even are) a whole month before bitcoin? secondly - what are the biggest risks to the company? Could regulation about crypto (broadly speaking) have a significant knock on effect? I just watched the interview with Mike Edwards. He spoke exactly like I knew he would. There was nothing new or interesting about the interview at all. If anything it may give awareness to potential new investors but apart from that there was no real substance in the interview. This seems to be linked to the decline in cryptocurrency prices in general. I still stand by my opinion that the IPO valuation was too high. Did the likes of Miton, Jupiter and Henderson get a nice discount off the IPO listing price? Did they jump ship as soon as the stock was listed possibly making a nice quick profit at the expense of the smaller investors who are sitting on losses? Only institutional selling could cause the price to move in such a manner. For me if I became a customer of Argo and mined say Bitcoin using their MaaS model, I would need a crypto wallet to store the Bitcoin in which Argo does not seem to offer. I am not convinced the demand is there to really scale up this business to any significant level. However, I will keep an open mind and will let the sales revenues tell me how this business is doing.